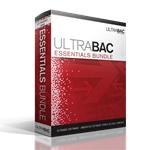 UltraBac Essentials provides a complete data protection system for your basic business server solution. This product provides reliable, easy-to-use backup and image restore capabilities tailored specifically for the SMB. The bundle features UltraBac data protection, UBDR Gold bare metal disaster recovery, Locked File, and Exchange protection all at an affordable price.